Are you looking to add presence and punch to your mixes? Parallel processing could be the way forward. So, what exactly is parallel processing? No doubt you'll be aware that, within any DAW, there are two primary ways in which effects can be added. The simplest and most direct way is to chain a series of effects to interrupt the dry sound of an audio or software instrument track via its inserts. This process feeds the dry sound to the first processor, which then feeds its processed result to the next, and so on, thereby creating a chain of effects which run in series from one to the next. However, the second way in which effects can be added is via an auxiliary, where the dry original sound remains untouched before this second audio feed (via the auxiliary) provides a second audio stream, complete with its effects. Traditionally, auxiliary busses are thought of as places where spatial effects such as reverb and delay are added, and they're used to blend the required amount of effect back in with the dry signal. This ensures a balance between the clarity of the original and the desired effect added at the required level. "This is the definition of a parallel processing treatment; a second audio signal running alongside, or 'in parallel' with the original sound to enhance and enlarge it in some way." This is the definition of a parallel processing treatment; a second audio signal running alongside, or 'in parallel' with the original sound to enhance and enlarge it in some way. Yet parallel processing is rarely used as a term to describe the addition of reverb or delay, as it's seen as a more specialised effect. Perhaps the reason for this is that the most well-known use of parallel processing is when it's used to make signals more punchy, more dynamic and more present in a mix, and reverb and delay treatments rarely achieve these specific results. 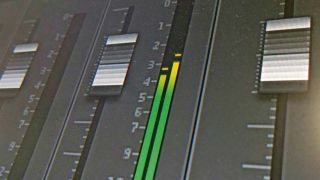 A better example of what we tend to mean when we refer to parallel processing would be the technique which has become known as 'New York-style compression', where the same process - routing a sound or a group of sounds to an auxiliary - is used to add power and punch. As its name suggests, New York compression uses a compressor on that buss to heavily squeeze the dynamics of a drum group so that they're more consistent. In isolation, when playing back solo'd, the effect would probably sound too much. but when blended in with the original dry drum sounds, the addition of this new drum channel gives the whole mix a punchier, harder flavour which can add serious amounts of power to a track.